Tried horses are a big risk for any prospective buyers, especially when their best form is a fading memory. But former talented-three-year-old Kutchinsky can prove a windfall for his new connections in Monday's Group 2 $400,000 Adelaide Cup (3200m) at Morphettville. Trainer Danny O'Brien paid $66,000 for the former Group 1 Queensland Derby placegetter last August and his win in last weekend's Roy Higgins Quality at Flemington already has his owners well in the black, having amassed in excess of $150,000 in prizemoney. And the $254,600 on offer to the winner of SA racing's ultimate staying test is a lucrative carrot for the in-form stayer. "We've been really happy that he's getting back to his best form,'' O'Brien said yesterday. "He had a good grounding. To run a the 3200m you need to do the miles and he's done that. He's fit and he's tough." Another huge bonus for Kutchinsky is the booking of champion rider Craig Williams for the Adelaide feature. 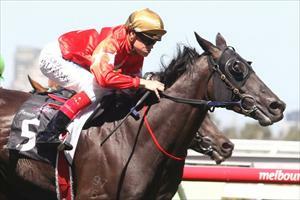 "Kutchinsky's going into the race in really good form coming off a last start win. He's got a good jockey in Craig Williams riding him so there are plenty of positives," O'Brien added. The Flemington-based trainer, who won the 2005 edition of the Adelaide Cup with Demerger, said last weekend's victory has given him every confidence Kutchinsky will be a major factor in the feature. And a 1kg penalty for his weekend win hasn't put a dampener on the in-form trainer's confidence coming to Adelaide, with Kutchinsky now carrying 55gk - 1kg above the minimum. "Every time he's stepped up in distance he's improved," O'Brien said. "We needed to see him run the 2600m right out on Saturday to be taking on the two miles. "It was a very strong tempo in the race and he stayed in out really well, we're happy to chance the arm that he'll run out the two-miles strongly and if he does, he'll be right in the finish."